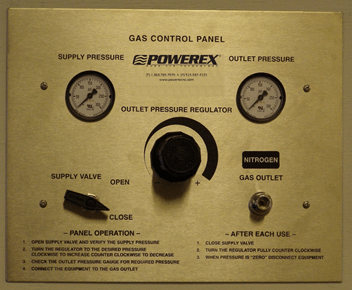 Powerex sleep lab control panels allow for the adjustment of oxygen to patient with entering the room. They feature click style flowmeters, 0-15lpm flow, inlet and outlet supply tubes with demand checks and DISS fitting, and can be plumbed left to right or right to left. All panels are NFPA 99 and CGA compliant.